Is 3D Mammography more effective in detecting breast cancer? 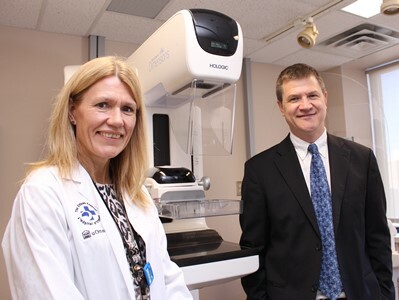 Researchers from The Ottawa Hospital Breast Health Centre and the Ottawa Integrative Cancer Center (OICC) have opened the Ottawa site of the Lead-In to the Tomosynthesis Mammographic Imaging Screening Trial (TMIST). The Breast Health Centre is one of three clinical trial sites to launch the Lead-In in Canada. It is expected that shortly this trial will be integrated into a larger U.S./Canada TMIST, managed by the ECOG-ACRIN Cooperative Clinical Trials Group. TMIST is the first large randomized, multi-centre study to assess whether a novel “3D” digital tomosynthesis technology combined with 2D digital mammography may be more effective at reducing the incidence of advanced breast cancers than conventional 2D mammography alone. Previous smaller studies suggest that this new kind of mammography can increase breast cancer detection and reduce the rate of false positives and recalls for women who do not have cancer. If successful, implementation of this technology would provide greater assurance of an effective test, reduce patient stress and anxiety, and ultimately reduce costs to the health-care system. The current Lead-In study aims to enroll 6,300 women in Canada, including 2,000 from Ottawa. Women attending mammographic screening at the Breast Health Centre may be approached to participate. Digital breast tomosynthesis uses multiple low-dose images of the breast that are layered into a pseudo 3D view instead of the traditional 2D views. As information is not superimposed, tomosynthesis creates a richer and clearer image that may help avoid missing cancers that may be hidden in surrounding breast tissue. Interested in participating in this study? Please ask your doctor to fax a request to The Ottawa Hospital Breast Imaging Booking office at 613-761-4405, clearly indicating interest in the TMIST study. Breast cancer is the leading cause of death amongst women between 40 and 50 years of age. At The Ottawa Hospital there are one thousand new cases of breast cancer diagnosed per year. Screening mammography has been shown to reduce the mortality of breast cancer. Specifically, women with breast cancer who underwent prior screening had a death rate of approximately six percent after five years compared to 15 percent for people who did not undergo screening. Despite this fact, there is extensive controversy surrounding screening. The harms of high numbers of false positives from 2D mammography have called screening into question. For every 100 women who are recalled for additional testing, more than 90 will have a normal finding or benign disease. This high number of initial false positives creates stress for women and may lead to decreased screening use, with a potential greater loss of lives from undetected cancer. It is hoped that tomosynthesis technology will reduce false positives, improve sensitivity and overall accuracy of digital mammograms. The full TMIST study of 165,000 women will be led by Dr. Etta Pisano, Dean Emerita, College of Medicine, Medical University of South Carolina and current Vice-Chair of Research in the Department of Radiology at Beth Israel Deakoness Medical Center, Harvard University. The Canadian Lead-in study is being led by Dr. Martin Yaffe, Senior Scientist, Imaging Research, Sunnybrook Research Institute, Professor of Depts. Medical Biophysics and Medical Imaging, at University of Toronto. This study has been approved by the Ottawa Health Science Network Research Ethics Board. Further details are available on the Canadian Cancer Trials website. Since its opening in 1997, The Ottawa Hospital Breast Health Centre has been dedicated to providing the highest quality care for breast patients across the Champlain Local Health Integration Network (LHIN). The Centre continues as a comprehensive breast centre that offers expertise in breast imaging, biopsy, diagnosis, risk assessment, surgical planning and psychosocial support for patients, and their families, in a caring environment. The Breast Health Centre offers high quality assessments in diagnostic imaging, diagnosing more than 85% of the breast cancers at The Ottawa Hospital, performing over 2,500 breast biopsies every year.